Optimized Pages are a great way to improve search engine optimization, as they allow you to create a page of promotional products which are specifically targeted towards a particular market (e.g. Emergency Services), campaigns (e.g. 'back to school') or product ranges (e.g. low cost exhibition giveaways). Step 1: In your website Content Manager, go to Content > Pages. Step 2: Click on Add new page. The text to the right of each field explains its purpose. Make sure that your page URL has no spaces in it (you can use - or _, for example fall_fashions). When you've completed these steps, click 'Add new page'. Step 5: Your new page will be pre-loaded with a Text / HTML box. Click on Edit (the pencil icon) to add in text content. This should include your page title - i.e. 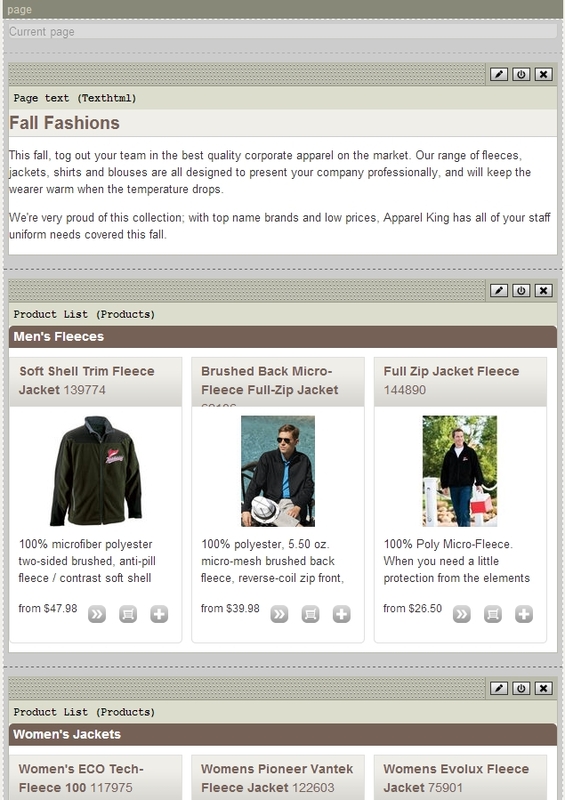 Fall Fashions - followed by text which includes the keywords your customers might use to find this page, for example: 'quality corporate apparel for fall'. Click 'Save'. 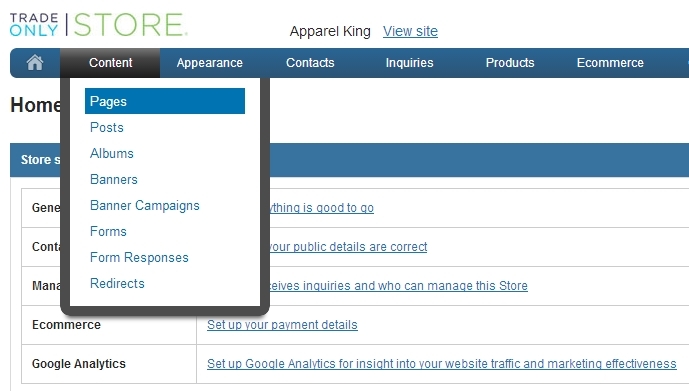 Step 6: Next, choose the Product List module from the drop down menu at the top left hand side of your screen. Step 7: Now you need to add in the codes of the products that you want to feature on this page. These are the Trade Only product codes, not the suppliers' product codes. Here's the easiest way to do this. Open another tab on your website browser, and in that new window go to your website content manager (it doesn't matter that you already have it open). This time, open up Products > Find a Product, and you can use the keyword search to identify which products you'd like to feature on your landing page. Simply copy and paste the product codes (one at a time) into your original tab - in the Product code field shown below - and click Insert. Step 8: You can give this line of products a title, for example Men's Fleeces. You can also pick and choose how many products you want to show on this line using the 'Show' options. Click Save when you're ready. 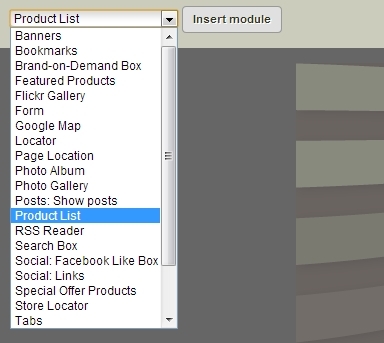 Step 9: You can add in additional Product List modules so you can show multiple lines of merchandise. Then simply drag 'n' drop the modules where you want them to appear on the page. Step 10: Click on Publish. Step 11: The last (optional) step is to link to your new page from your home page. To add a link to your new page from your navigation tabs, go to Appearance > Overall Layout and click on Edit on your Bookmarks module. And then use the page drop down menu to locate your new landing page. Click on Insert and it will appear on the right hand side at the top. Drag 'n' drop it where you want it to appear in the Bookmarks list (note: you can make this a drop down from an existing bookmark by pulling it to the right to indent it.). Click on Save, then Publish and you're done!